This impressive work takes its name from the fact that the large, bright red, riveted steel H beams, together form the letter K. But this was not the starting point of the structure. Di Suvero is mainly interested in the spatial effect of the linear elements that constitute the sculpture. Although these are perfectly balanced, they constantly seem to lose that balance, which creates a certain tension. Around 1960, the American artist began making large-scale, playful structures made up of massive wooden and iron beams, which are interconnected by means of ropes and steel cables. All the components keep each other in balance and appear to float in space. 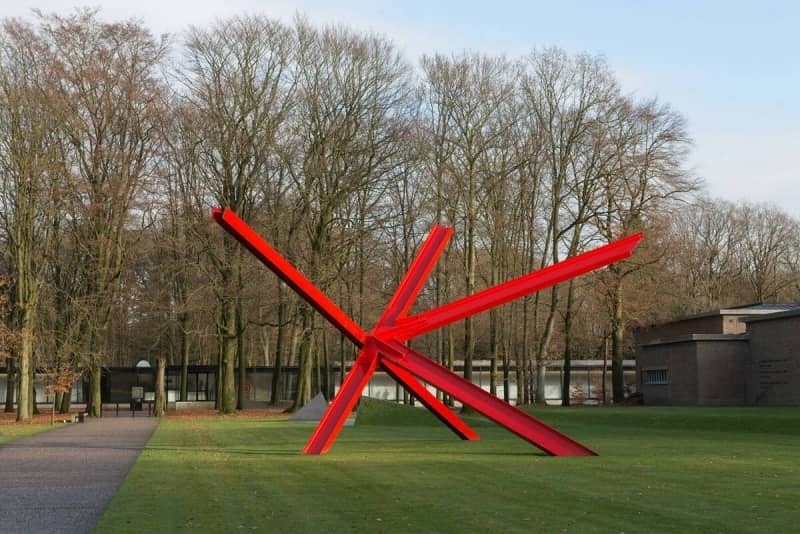 Di Suvero usually produces his gigantic sculptures himself, and that is also the case with K-piece. He operated the crane with which the steel H beams were lifted and positioned and welded the parts together. This is his way of composing his sculptures, with the aid of a crane. He describes his sculpture as ‘a painting in three dimensions with the crane as my paintbrush’.